I bought a bunch of cilantro this week for a new recipe that I thought I've have posted here today. But things have been pretty crazy here at the Frugal Follies household, so I think the new recipe will have to wait until next week! Instead, I'm posting my recipe for cilantro pesto, which is a cheaper yet delicious substitute for basil pesto. I'll definitely be making it soon with the leftover cilantro from my recipe! 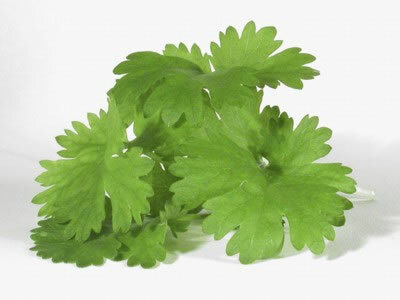 Remove leaves from the cilantro stems. In a food processor place the cilantro leaves and the other ingredients. Process until smooth. Would you serve this with pasta just as you would basil pesto? I was at a local Italian restaurant, and the waiter and I were chatting about the pesto. "Do you like it?" I asked. "I....well, I prefer cilantro pesto." "Cilantro pesto? I never would have thought of making pesto from cilantro!" "It is SO good. You should try it. Nothing else compares." And then here you are telling me how to make it! Handy! I have been cooking a lot with cilantro lately we really seem to love the taste. I never thought of making a pesto with great idea. Thanks for sharing this on foodie friday. Thanks for coming by and linking up to Good Tastes Tuesday Recipe Link Party on Golden Reflections Blog!! YUM! I love cilantro - and never thought of making it into pesto! Just wanted you to know that your recipe is being featured today on foodie friday. I will be pinning and tweeting it too this week. Thank you again for sharing it with us. Thanks for linking up to my Tutorial Tuesday Blog Hop. Your pesto sounds wonderful! Thank you so much for sharing at last week's All My Bloggy Friends :) I can't wait to see what you share this week!